Burning buildings, stores and shopping malls robbed and vandalized, streets strewn with debris, blackened carcasses of buses, cars, police vehicles . . . These images of London, Birmingham, Bristol, and Liverpool have been beamed around the world on television. They evoked what Labour deputy Diane Abbott called “a war zone” (a theater, said Le Monde on August 10th, of “urban guerrilla warfare”). 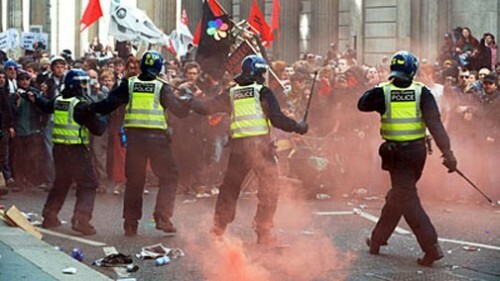 The French media immediately wanted to set the tone for interpreting these events: it is the fault of social tensions due to cuts in public funds for the most vulnerable; it is the fault of unemployment and thus idleness; and it is the fault, of course, of the British police force (“the blunders of the police force” according to the conservative daily Daily Mail, just as false as the French newspapers). All is explained . . . and the hooded rioters are “youths” with restless hearts. Well-organized, all the same (one is thus far from the spontaneous and superficial reactions of hooligans), with a communications system well-enough developed to sustain the assault waves for several successive days. But what about the government? Prime Minister Cameron, the Minister of the Interior, the Minister for Finance, the mayor of London were all . . . on vacation (Cameron in Italy). The rioters were definitely ill-bred to choose such a moment. They could have awaited their return. The shine has come off multiculturalism, which has long been presented as the British answer to racial tensions, and which Cameron recently admitted is a failure (as did Angela Merkel of Germany). It was based on the irenic conviction that various racial communities could cohabit harmoniously in the same territory. This illusion is due to the ideological presuppositions that one finds on the right as well as on the left among intellectuals who simply deny the burden of reality. Realities so disturbing to their mental comfort that they must be stubbornly denied. Until the day they catch up with you . . . The present System, sapped by its internal contradictions, is in the process of imploding. Racial warfare is now bubbling beneath the surface in many European countries. Now is the time to denounce without respite the devastations of liberal capitalism and to preach a realistic, that is to say, a racialist, conception of a society in order to free the minds and will to resistance and reconquest or our European brothers. He estado buscando un poco por artículos de alta calidad o entradas en blogs sobre estos temas. Explorando en Google por fin encontré este blog. Con lectura de esta articulo, estoy convencido que he encontrado lo que estaba buscando o al menos tengo esa extraña sensacion, he descubierto exactamente lo que necesitaba. ¡Por supuesto voy hacer que no se olvide este sitio web y recomendarlo, os pienso visitar regularmente.